(a) Check that the CD is not deformed or cracked. 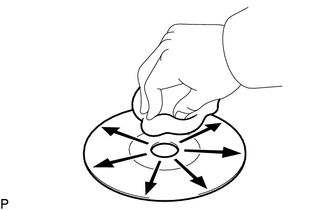 If dirt is on the CD surface, wipe it clean with a soft cloth from the inside to the outside in a radial direction. 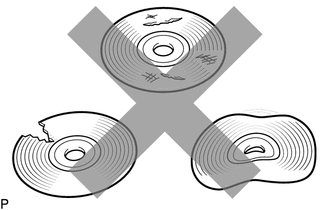 (a) Replace the CD with a known good one and check that the malfunction disappears. (a) Check the radio and display receiver assembly installation condition. (1) Check that the radio and display receiver assembly is properly installed. The radio and display receiver assembly is properly installed.